I always love when families come back for their portraits year after year, and when I see a family's name in my inbox after a few years it always puts a great big smile on my face as I get ready for another fun session with them, excited to see how much they've grown and changed. This is one of those families. We met when I was a first grade teacher in Massachusetts, and while I never had any of the three kids as my students, we did enjoy a few sessions together and spent a lot of time designing a gallery wall in their home. When Wendy contacted me this spring and told me she'd love to plan some beach portraits and that she was excited to add to their gallery wall in the living room, I was all in and we started planning their Cape Cod family session! We met at the very end of West Dennis Beach at the Bass River for their sunset session, and it was the perfect spot for cuddles, tickles, and lots of splashing in the water! I just love everything about this photo. They went in for a family hug. Little sister is hidden on the inside (see that arm sticking out?) and her big brother couldn't resist peeking out with the most amazing smile. This was truly such a fun evening together, and I can't wait to see what their new gallery wall looks like with these beach portraits on display! Did you love this session? 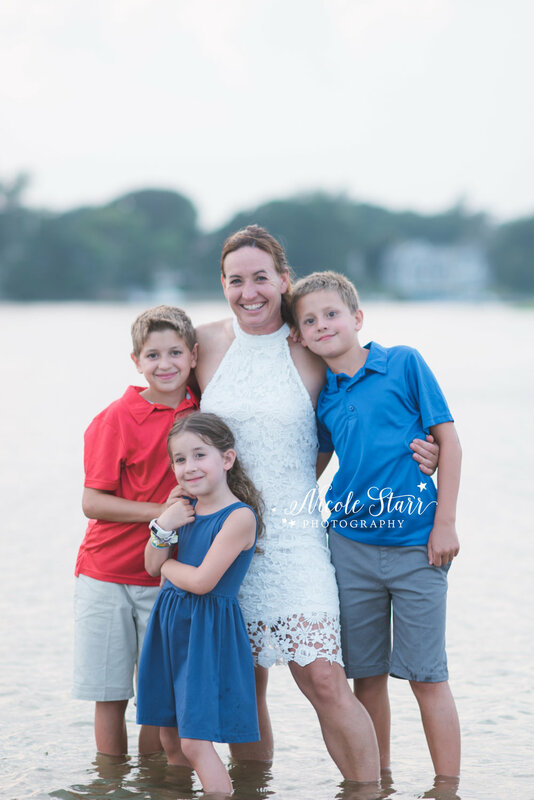 Check out another fun family session at Corporation Beach in Dennis!